Plan a Family Greenway Adventure! Author Scott RestonPosted on June 11, 2009 August 9, 2010 Categories GreenwaysTags bike, Greenways, maps, raleigh3 Comments on Plan a Family Greenway Adventure! This morning I decided to spend some time exploring the Lower Walnut Creek Greenway. According to the greenway map that I was using (here’s a link to the 2010 version), this stretch of trail is 4.2 miles long. Unfortunately, the trip computer on my bike stopped working, so I’m not really sure how far I rode. This trail connects with the Rocky Branch Trail, providing passage from NC State at its west end, east almost to Walnut Creek Park along the south side of Raleigh. Durant Nature Park is a 237 acre park located in North Raleigh, just north of I540. Park resources include five miles of hiking trails (some trails are designated OK for mountain biking), 2 lakes for fishing (and canoeing using park-provided canoes in the warmer months), an open field for games/sports, a sand volley-ball court and a playground. Check out the park’s features page on the City of Raleigh site for additional info. The official Raleigh Parks and Rec Greenway map is here. 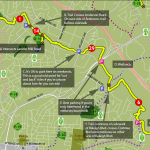 Black Creek/Umstead/Reedy Creek (N&O) -This trail will get you from Cary’s Godbold park on NW Maynard, past Lake Crabtree, through Umstead and the Museum of Art and eventually to Meredith College at the corner of Faircloth and Hillsborough. I’ve ridden about half of this with my 7-1/2 year-old son (Meredith to Edwards Mill). It’s a little hilly, but fun. 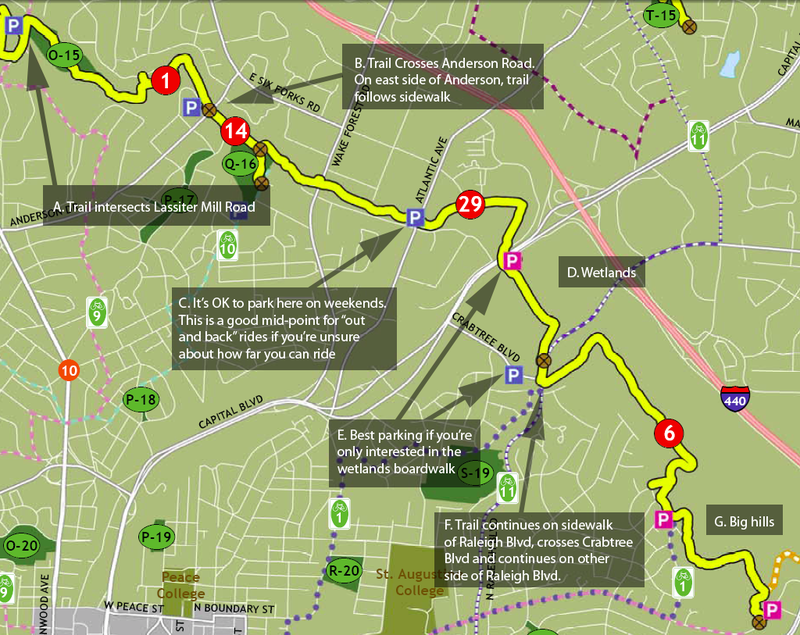 Crabtree greenway map (N&O) -This will take you from SW Raleigh’s Oak Park neighborhood near Umstead, along Crabtree creek past Crabtree Valley Mall, past some beautiful downtown neighborhoods, through some (suprising!) nice wetlands, across Raleigh Blvd and evetually to Milburnie road, not far from Wake Med.The section between Hodges and Raleigh Blvd is fun for the kids. There’s an interesting roller-coaster of a boardwalk and the wetlands are a great place to spot turtles and birds. There’s also a nice gazebo – a good spot for a break. There are some big hills on the eastern-most end of the path. American Tobacco Trail map (N&O) – Our family visited this trail over the 2009 Memorial Day weekend. We parked at the facilities near the intersection of White Oak Church Road and Green Level Road (the 5.3 mile mark on this map). We traveled north until we hit where the trail was under construction (about 2 miles) and then traveled south to southern end of the current trail. Round trip back to the car was about 15mi. There are several places where you cross rural roads. Most of the trail is shaded. The trail is relatively flat and a good ride for young cyclists. There’s a really nice stretch through some wetlands where you can see some dams created by some industrious beavers. Check the Triangle Trails site for some additional maps. The Wake County site has some directions to the trail heads.